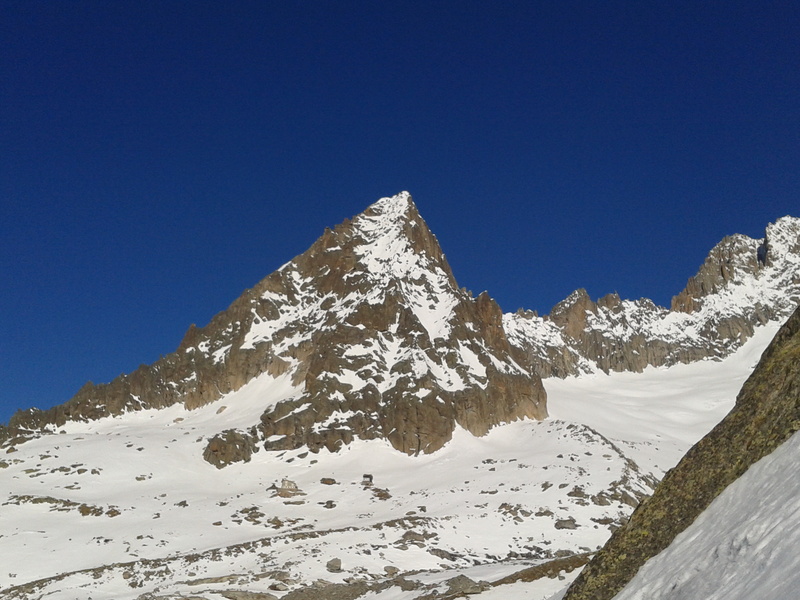 With the South Faces loaded up well this winter, the South Face of the Aiguille du Moine came into once in ten year conditions and saw its third descent by the Italian team (http://www.planetmountain.com/english/News/shownews1.lasso?l=2&keyid=39218#). Made legendary by Jean Marc Boivin’s first descent in 1987 during his heli ski enchainment of the Moine, Petit Dru, Whymper, NNE Les Courtes and South side of the Grandes Jorasses (video from 5.56), this face had previously only been repeated by Jerome Ruby and Dede Rhem. In the original film the slabby face was seen well covered by snow, while this year many rocks were showing although with a skiable line until 30 m from the base. With April temperatures due, Wednesday could be the last day the route held together before the thermo-nuclear sun caused the snow to slip off the slabs. 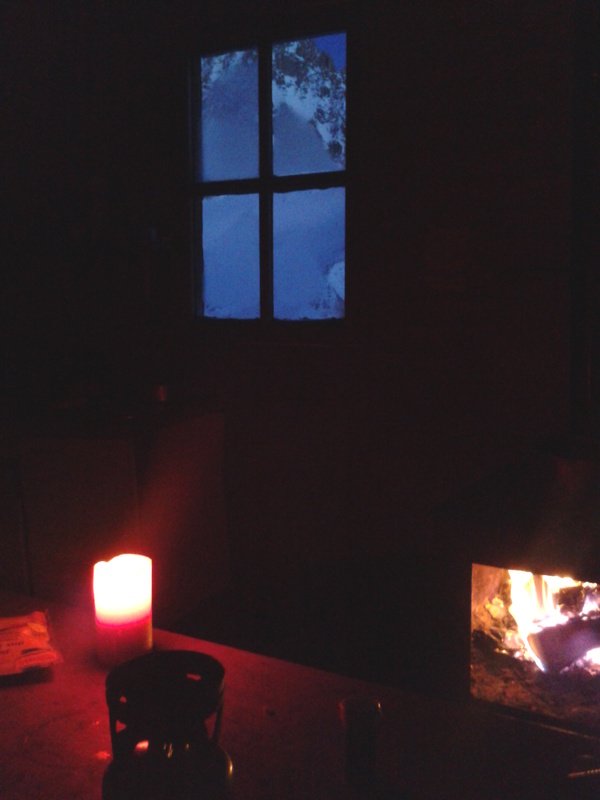 I arranged to meet Luca at the midi to go up and missed the lift when my car got stuck in icy ruts in the carpark. Half an hour of chopping with an ice axe and a push from 4 people got the car into a parking space and I joined Luca in the VB. Arriving at the hut I toured over under the face and could see a skiable line still there albeit a tight steep crux section threading rocks into the link couloir and what looked a slight upward traverse to reach the lower face. Here I discovered I had left my SD card in my computer so any photos would be on my phone. Ben Briggs came up to join us and after a meal we were early to bed for a pre-dawn start. I woke up suddenly at 1 am with my lower back in spasm and spent the next few hours unable to get comfortable. Probably a result of skiing through hard moguls in the Geant ice fall with a heavy rucksac and getting jarred. During this period I realised that if my back hadnt released by the summit,I wouldn’t be in a position to ski, and the snow would be unsafe to downclimb and I’d be stuck there. As it was this type of route required everything to go well for me it, didnt feel right to go. I ate breakfast with the guys and ten minutes after they left almost went to catch them up. Serious fomo but alot of nerves too. I’m not that keen on rocky routes preferring steep snow that enables smoooth flowy linked turns. I’ve also realised that getting old I’ve done so much off this that it doesnt make that much difference whether I go or not but I do want to ski good snow to get those sweet sensations. As a younger man I’d ski just for the sake of doing it. The sense of achievement from doing it is momentary these days before I start thinking of the next hit. After another hour’s sleep I got up and went to see how the boys were getting on. Seeing them only half way up the face again spured the thought of catching them up and guessed progress had been slow due to underlying facets. The descent went smoothly and quickly for the boys with Ben leading and getting down to the step at the bottom quickly. The flake the Italians had abseiled off a few days before had melted out and Ben placed two pegs I had brought to rap onto the exit ramp. 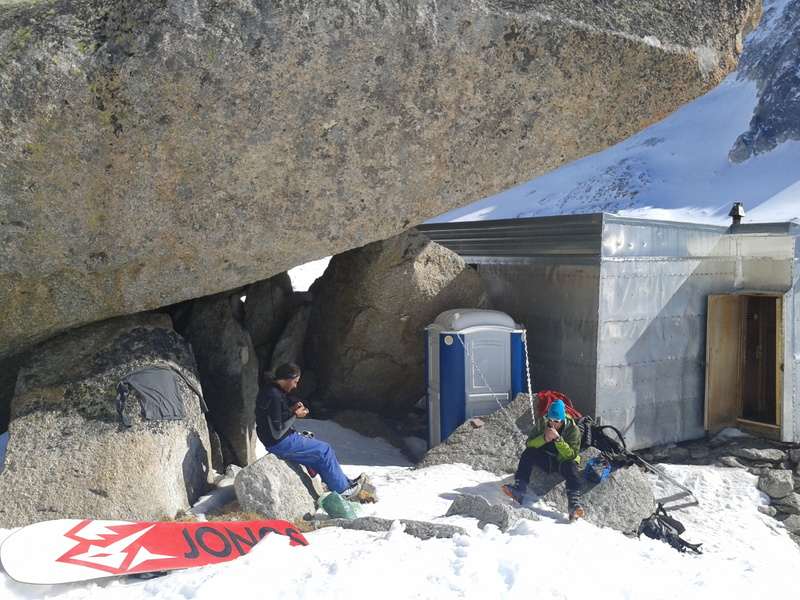 The boys joined me at the hut and chilled in the sun after a nervy descent. Luca was keen to stay up another day while I had had enough sitting round and being restless was thinking of a day hit the next day. Persuaded to stay up for the Croullant we passed the afternoon at the hut talking, eating and drinking and avoiding the fierce alpine sun. You could have fried an egg on the aluminium flashing on the hut. An early night and up at 2 am. A short way from the hut Luca realised he couldn’t make it on foot due to the breakable crust. I didnt want to go into a couloir on my own with day temps so high so decided to go back to Col des Dourtes and ski it on spring snow. Dumping all my kit on the morraine I was alot quicker than expected on the 1100 m ascent and arrived at the col at 7 am where the wind was blowing lightly. 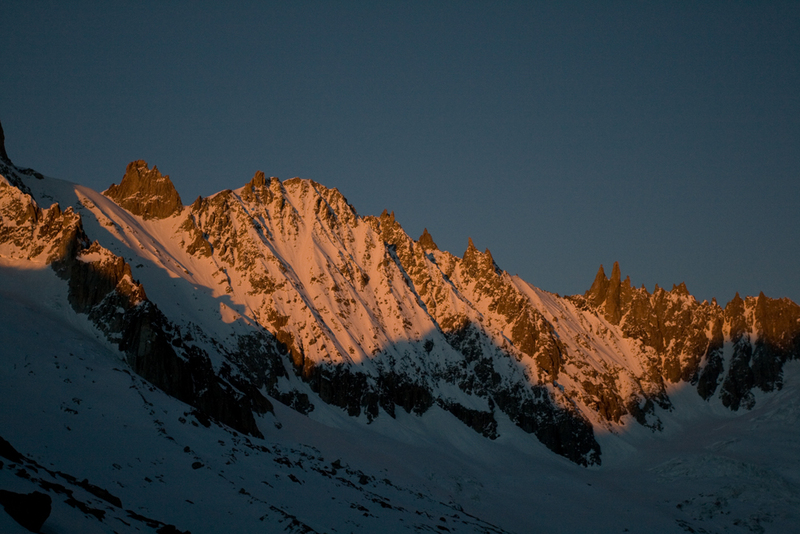 The sun had just risen above mountains at the head of the Argentiere basin and sitting on the ridge the dawn rays stopped my nose freezing. It was going to be a long wait for the snow to soften and I had to dodge around the col to avoid the shadow from the Tour des Courtes as the sun moved around. As it got warmed I was able to curl up on a rocky ledge and cat nap, occasionally studying the mountains as the play of dawn light revealed certain features that had previously gone unnoticed. At 1015 the snow looked good and I started down, unlike the scratchy ice a week before, the snow was now smooth velvet enabling fast drift turns and within 10 minutes I was back at my gear dump on the morraine and an hour later in Chamonix. Luca and Ben are descending the second snowfield below the summit. Unfortunately I left my SD card at home so all photos are from my phone. Luca and Ben chilling out after their descent of the Moine. This entry was posted in Skiing and tagged Aiguille du Moine, Ben Briggs, Boivin, Col des Droites, Courvercle, Luca Pandolfi, Steep Skiing, Talefre by Ross Hewitt - Skiing, Climbing, Photography. Bookmark the permalink.